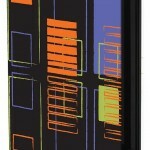 My bold & energetic graphics can now be found on personalized electronic device cases! 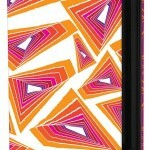 I have teamed up with Solid Line Products – Keka brand – fully customizable hardcover cases for all iPad models, Kindle, and Kindle Fire. I have developed 10 exciting designs and have even come up with a few graphic surprises on the inside cover – just the touch you need to truly punctuate your unique, personal style! 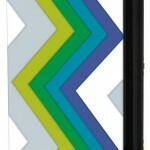 See the full line in my Designer Case Gallery of the Keka case website. 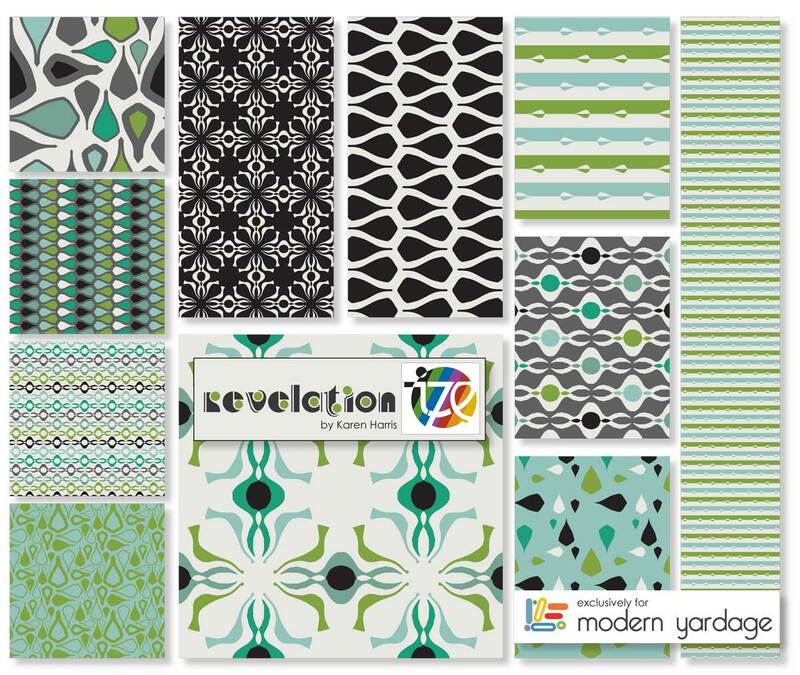 So excited to launch my first textile collection with Modern Yardage, one of my new licensing partnerships! My new collection is called Revelation. The first colorway, Succulent Garden, illustrates the versatility of the Modern Yardage system at its very best. Here, I offer multiple options within each color and pattern so that you can “customize” your collection to make your space and/or project truly unique. The Succulent Garden colorway is “on trend” in lush shades of emerald, chartreuse, and aqua, accented by neutral creme, charcoal, and black. 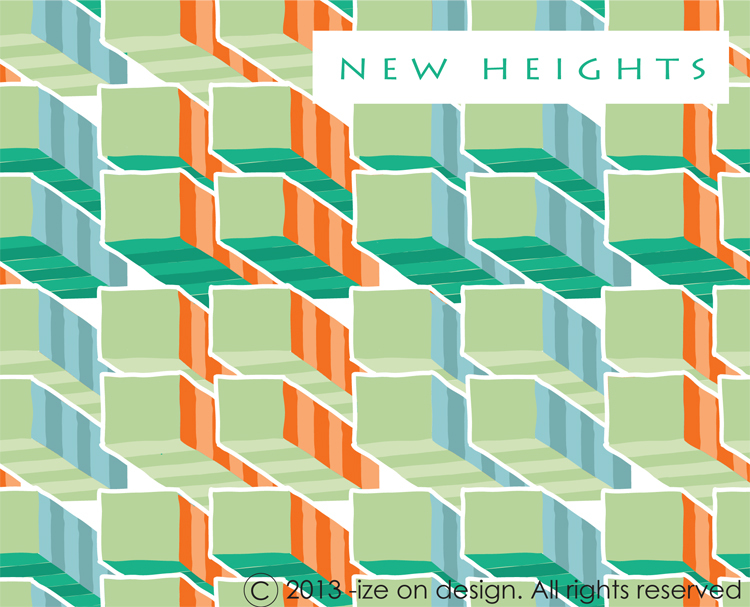 There are six bold, graphic patterns in various shades and scales offering a whopping 98 possibilities—from very large scale, bold graphics for home interiors projects, to smaller scale graphics for crafts, quilts and fashion. The images above illustrate just a few of the patterns available. To view the entire collection, click HERE! More vibrant colors to come, so stay tuned! So excited to announce a brand new and very exciting licensing partner! 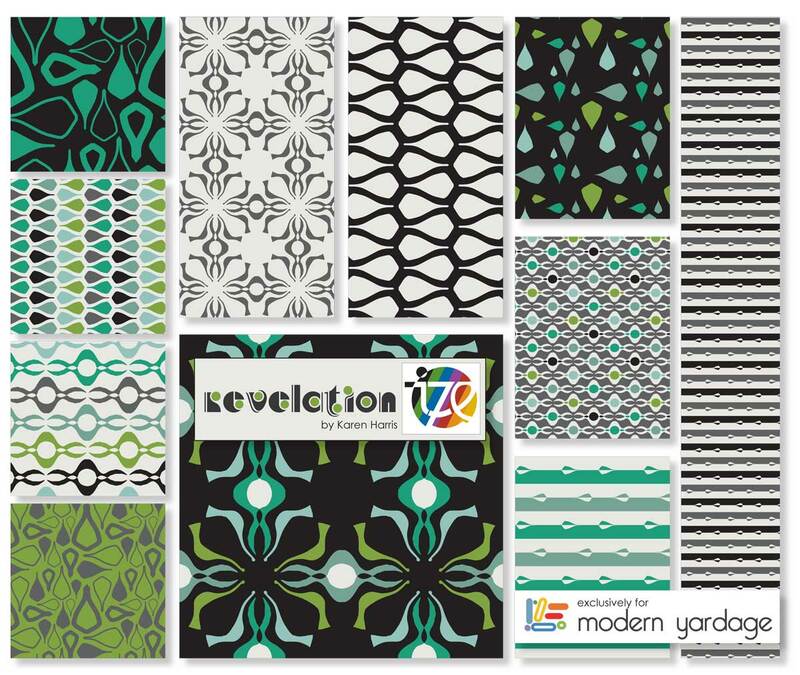 I have teamed up with Modern Yardage! A newly launched digital textile business with a young, energetic team with fabulous ideas to rock the textile industry and bring new, fresh designs to the marketplace. Here is a sampling of my designs launching soon!! I say “stay tuned” quite a bit around here! With good reason!! 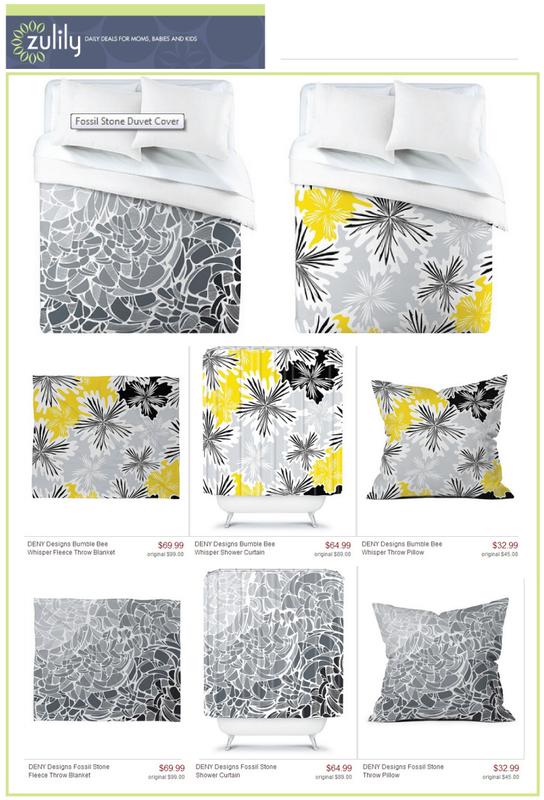 Pop on over to zulily to catch their new Gray & Yellow: Textiles sales event featuring our Fossil Stone and Bumble Bee Whisper patterns for DENY Designs. Special prices. Limited quantity. Limited time! So excited to see our Dexterity Emerald pillow featured in this DENY Designs pin from their blog! Such a great idea highlighting the way different design disciplines influence each other – street style vs. home fashions! And, of course, featuring the color of the year! Too Cool! You have just journeyed from Dublin, Ireland and viewed the fabulous work if Gillian Hollingsworth. 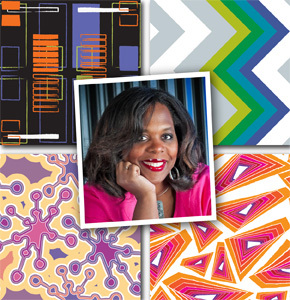 My name is Karen Swartz Harris and welcome to -ize on design in Akron, OH, U.S.A. I decided to approach this challenge by going back to my roots because in order to truly evaluate where we are going, we have to take a good hard look at how we got to this point. I am an architect by training and, when I learned about our theme of “flight”, I decided to approach the challenge from a different perspective…from above. My aesthetic is very architectural, modern, clean and detailed, yet organic in nature, using mostly hand drawn elements. It is my dream to build a lifestyle brand around my unique, graphic styling. I have secured some fabulous licensing partners in the home interiors space this past year and I am looking to develop similar partnerships in 2013. It’s my passion to infuse sophisticated styling into objects and spaces, while at the same time injecting a little fun! I call my collection “Looking Up” – looking up at all of the infinite possibilities where the sky is the limit! 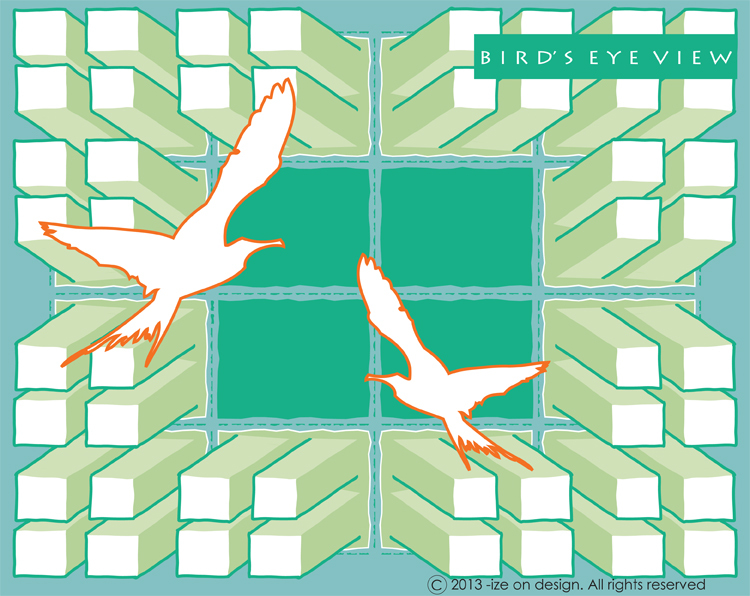 My anchor pattern/illustration is titled “Bird’s Eye View”. I feel a new year is a perfect opportunity to step back, look at the bigger picture, establish goals and plan for what’s next. 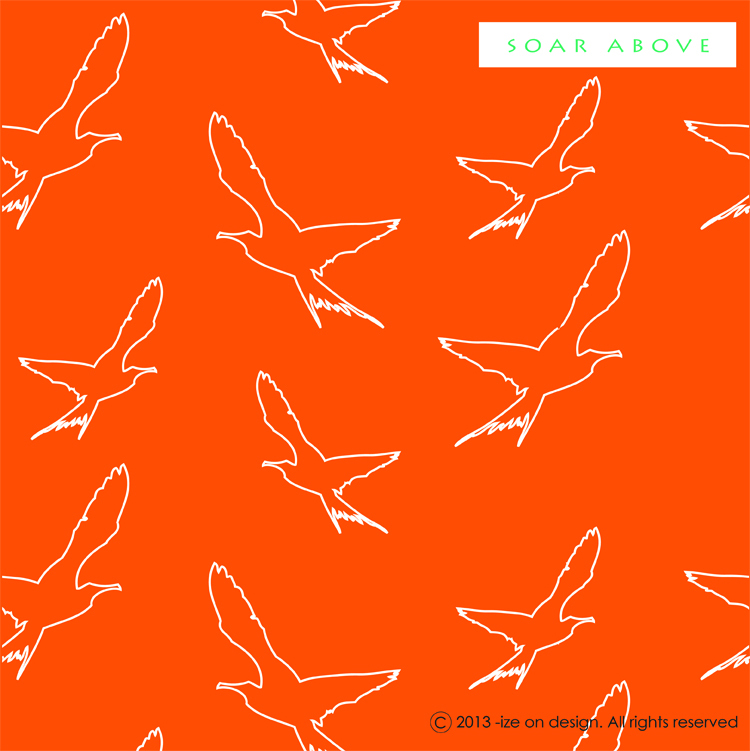 And “Soar Above” our own expectations and the limitations that we put on ourselves! Thank you so much for paying me a visit. Please bookmark my site and take a look at some of the products that we are impacting! Up next…the artistic styling of Piia Põdersalu, who is originally from Estonia, but now resides in Israel. Enjoy!